Get WHOIS DATABASE of over 333 Million Domains. In cleaned whois database we delete privacy protected domains, duplicate telephone numbers / emails & incorrect numbers (numbers less than actual digits of particular country) etc. 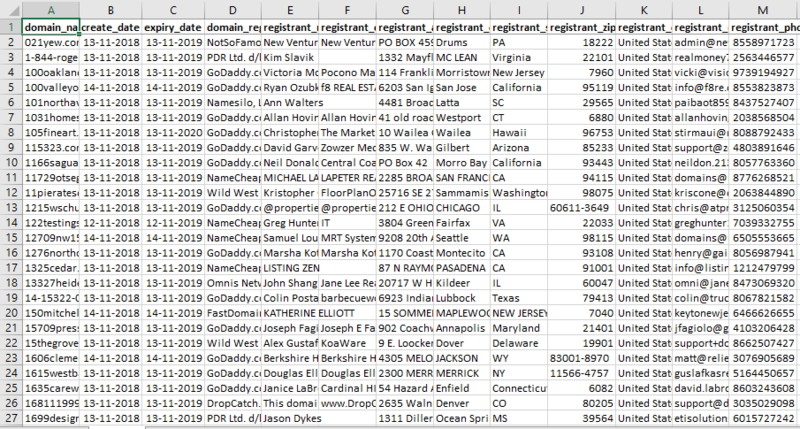 Each whois records will contain all cleaned fields of the domain's WHOIS information along with it's contact details (domain_name, create_date, expiry_date, domain_registrar_name, registrant_name, registrant_company, registrant_address, registrant_city, registrant_state, registrant_zip, registrant_country, registrant_email & registrant_phone) of the domain owner, whenever available. Generally we provides 8 countries (Australia, Canada, France, India, South Africa, United Arab Emirates, United Kingdom & United States) cleaned database on daily basis. All whois databases are uploaded on 09.30 PM CST.